A complete nutrition shampoo for normal to slightly sensitised hair. Complete nourishment from roots to ends. Hydration of the scalp. Soft, supple and light hair. Aqua, sodium laureth sulfate, sodium chloride, dimethicone, coco-betain, cyclodextrin, glycerin, ppg-5 celeth-20, sodium benzoate, sodium methylparaben, isostearyl neopentanoate, salicyclic acid, carbomer, ethylparaben, guar hydroxypropyltrimonium hydrolyzed wheat protein, linalool, limonene, glyceril lynoleate, safflower glucoside, butylphenyl methylpropinal, glyceryl oleate, glyceryl linolenate, sodiumhydroxide, citic acid, fragrance. I keep switching my hair products, but I switch between 2 or maximum 3 products. Using more than that can damage your hair like nothing else. These shampoos are made of chemicals and excess experiment on hair can destroy your hair. Kerastase nutritive bain satin shampoo is for slightly sensitive hair. It controls my frizzy hair. The best part is that after wash, my hair is not tangled. 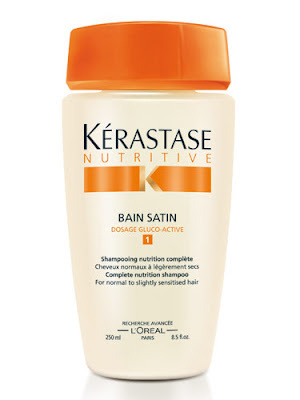 Whether I use a conditioner or not, it leaves my hair soft, untangled and manageable. Even if you massage your hair with a nice amount of oil it removes all the oil in just small quantity without over drying hair. Only available at selected salons in big cities.